Unlabelled NIGERIA DRAW ARGENTINA, FRANCE, MEXICOLN RUSSIA 2018 MOCK DRAW. NIGERIA DRAW ARGENTINA, FRANCE, MEXICOLN RUSSIA 2018 MOCK DRAW. 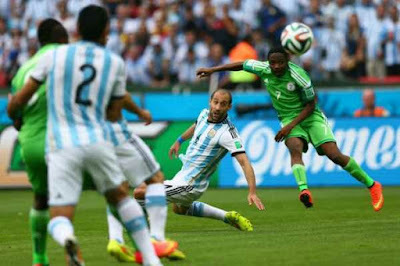 Nigeria have been drawn for the Russia 2018 World Cup according to former England striker and draw host Gary Lineker, who revealed that Thursday’s practice run pitted the Super Eagles against Argentina, France and Mexico.The Super Eagles qualified for next summer’sfinals in Russia with a game to spare and undefeated in a group that had Algeria,Cameroun and Zambia, but are in pot four due to an unfavourable FIFA ranking as 32 teams wait to learn their fate in the draw on December 1.Former Tottenham and Barcelona star Lineker, who won the Golden Boot at the 1986 World Cup where England were knocked out by Diego Maradona’s Argentina, will conduct the draw in Moscow with Russian sports journalist Maria Komandnaya and seven superstar ‘assistants including Maradona and Brazil’s Cafu.Lineker revealed on Thursday that a dry run of the draw saw Gernot Rohr’s men drawn alongside Argentina for the fifth time in Nigeria’s six world cup appearances, France who knocked Nigeria out at the round of 16 three years ago in Brazil and Mexico who hasnever played against the Super Eagles at the World Cup.Lineker also revealed that England have beendrawn in Group B alongside Roberto Martinez’s high-flying Belgium (pot 1), Senegal (pot 3) and Japan (pot 4).The 56-year-old wrote on Twitter: “Just had my first production and logistics meeting for next week’s @FIFAWorldCup draw. Had a quick run through (it’s complicated) and England ended up in Group B with Belgium, Senegal and Japan.”While England managed to avoid any previous World Cup winners in the practice draw, Lineker also revealed that Mexico were pitted in a “group of death” against Argentina,France and Nigeria.Lineker’s scenario for Nigeria is impossible though as both Argentina, who the Super Eagles defeated 4-2 in a recent friendly, and France are both in Pot 1 and two teams from the same pot cannot be drawn against each other.The draw will take place on December 1 in the Russian capital of Moscow at the State Kremlin Palace.